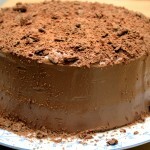 This simple chocolate cake is now going to be a firm favourite for birthdays and celebrations. It’s also a great one to make with the kids. Apart from the baking it only takes about 20 minutes to make and decorate. I’m not a fan of the typical butter icing that is normally on cakes, so here is one I found in an Anabel Karmel book using sour cream. It gives a really tasty finish. You could also decorate this cake with mini smarties depending on who it is for. Mix the cocoa, margarine, sugar together and sieve in the flour. Mix together using a hand blender for 2 mins. Divide the mixture evenly between the two cake tins and place in the oven for approx. 20-25 mins. Test by inserting a cocktail stick or a metal skewer into centre of the cake. It should come out clean. Remove from the oven, allow to cool, and then place on wire racks. To make the icing, melt the chocolate in a glass bowl over boiling water. When melted, fold in the sour cream, and then the whipped cream. Allow to cool slightly. To assemble, put some of the mix on top of one of the cakes. 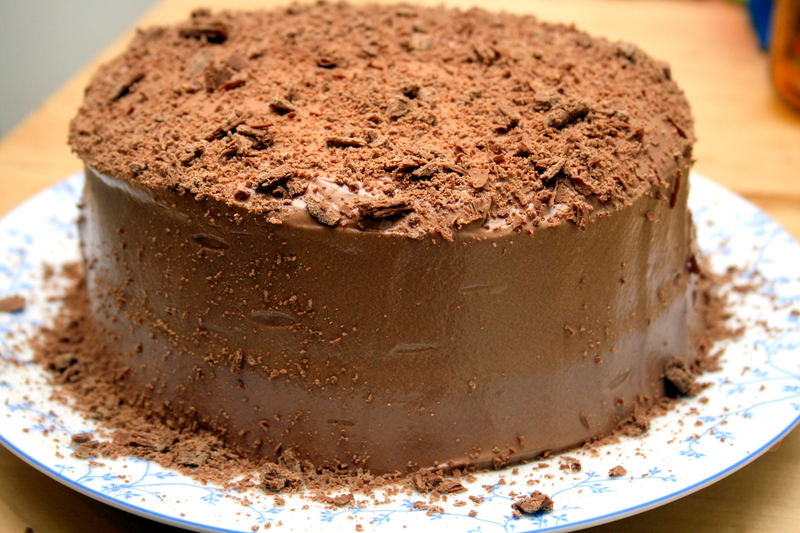 Place the other cake on top and cover completely with the chocolate mix. Smooth with a palate knife and top with crumbled flake. Chill for a couple of hours to allow the icing to set. I made this cake last night for a family get together today.. it was def very easy to make; and was very rich.. kids not mad about it (not sweet enough) but a hit with the adults.. wonder if you could add sugar to the icing to sweeten it up a bit? Glad you liked it. Those kids must have sweet teeth!! You could use less sour cream and more double cream and add a couple of tablespoons of icing sugar to the mix. It could also depend on the chocolate you used. If you used a strong dark chocolate (70% or greater) it may have been a bit too bitter for the kids. You could try using Milk Chocolate (again a good quality one), which would be sweeter.